Created by pediatrician and neonatologist Dr. Launice Melbourne, E.A.C.H. 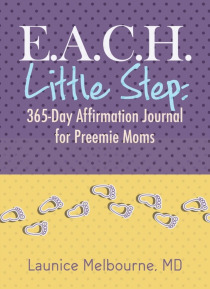 Little Step is a collection of daily affirmations tailored to moms who unexpectedly find themselves in the neonatal intensive care unit (NICU). This truly special journal shares psychological and spiritual support to mothers throughout their difficult journeys in the NICU, as well as once they return home. It provides pree… mie mothers a means to focus on important and often unaddressed issues, such as how to respond to family and friends who are insensitive about life in the NICU, and how to communicate with medical personnel. Notably, Dr. Melbourne also gives tangible steps that preemie mothers can take to document all the improvements and small joys that quietly occur in the NICU.